Hi there! Hope you have had a good week so far, not long until another weekend!!! Today I’m sharing a card that I have made using this fabulous digital image called Cornucopia, which is actually The Stamp of the Month over at From the Heart Stamps. You still have time to take part in this challenge as it will run until the end of the month. The rules are all HERE. I have also used this weeks i (heart) card sketches with a tWiSt #122 . The twist this week was ‘totally CAS with paper strips’. Mmm, not sure I quite complied with the twist part as I did add a little button and one of my own die-cut sentiments! You can also still take part in this weeks challenge, the details are below. I have also used papers from ‘Farmhouse’ by Crate Paper, Spectrum Noirs, button, twine and die-cut sentiment from Craftwork Cards. Next > In the meadow we can build…. Oh, WOW! This is so colorful and gorgeous! I have that paper pad and those strips of paper are perfect with your beautifully colored cornucopia! Karen, love this beautiful, elegant card. Perfect mix of papers for this fab image! Great card – fun DP touches in the otherwise CAS card! 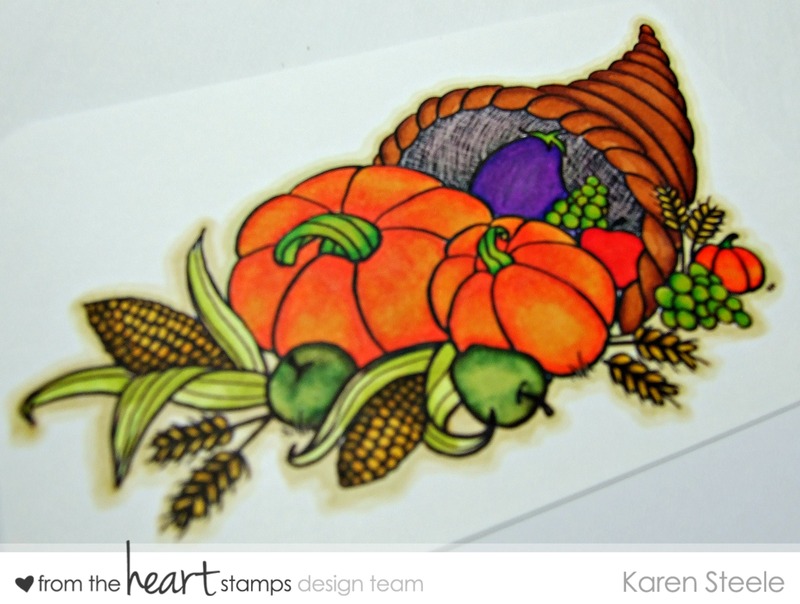 Lovely fall card! Love the cornucopia and great take on the sketch! Lovely card! Beautiful colors and design! Such pretty colours, Karen! LOVE your choice of patterned paper and your colouring is beautiful! Your cornucopia glows! I love fall with all it’s beautiful, rich colors! Gorgeous card, Karen!! Papers are so pretty and your coloring is awesome!